Today’s Mystery Photo returns to the Twin Cities Metro. Identify the location of the photo, scroll to “Comment” at the bottom of today’s post and leave your answer. All correct answers will be put in the hopper and I will draw a winner and announce the same next Friday. The winning name wins the coveted box of brand-spanking-new cotton swabs. Back in November and December I sat down with two world-class paddlers and talked about this trip. I hadn’t decided to go or said a word to anyone other than my wife, Lois. What I had decided was that this was either the year to do it or it was time to simply drop the idea altogether. I hoped to get a sense from the two gentleman if the trip was doable for a solo paddler and whether or not my paddling experience gave me a reasonable chance of success. In particular, I wanted to hear their thoughts on the St. Croix River above St. Croix Falls, the rapids along the Bois Brule and paddling Lake Superior in a canoe. I left both meetings encouraged and after more soul-searching, I decided I was going. I don’t hold anyone but myself responsible for that choice. I’m just grateful that they took the time to share their experiences with me. 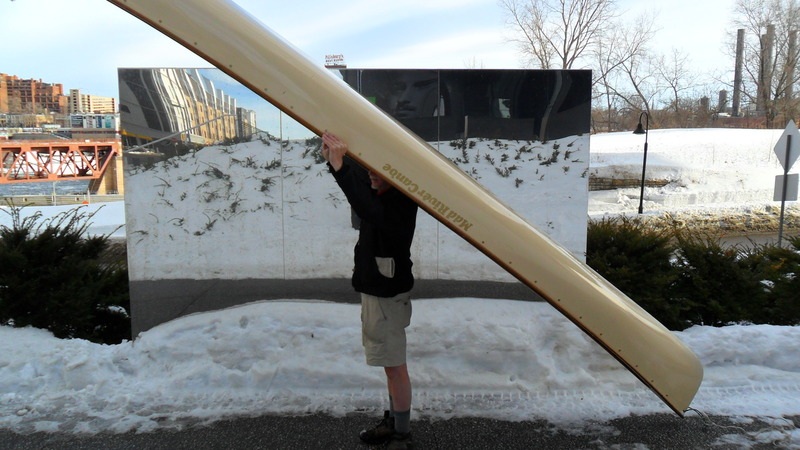 Minnesota is full of master paddlers and I’ve met several of them through the blog and in person. All have more time on the water than I do and yet they were still generous in their support of what is certainly a modest adventure compared to some of their exploits and no more exotic to Native and Euro-American paddlers of old than a road trip to Chicago is for us today. My, she's changed her hair color already (sigh). Lois, gave the trip her blessing but insisted that I take out a hefty life insurance policy, bless her heart. Now, I sometimes find her wistfully staring at the put-in date circled on the calendar or looking at real estate brochures for Grand Cayman. How she loves her catalogues. I’ve noticed too, that some of my single male friends have been very interested in my departure date. Bless their shriveled, little hearts as well. I know they’ll be a great comfort to her when (strike that), while (better?) I’m gone. Kidding aside (Ha), I left the man-cave on Tuesday and visited with some talented scientists and educators who make up the Rivers Institute team based at Hamline University. The program was conceived by Hamline’s Center for Global Environmental Education (CGEE). The Institute offers two sessions each summer to train 3rd through 8th grade teachers in outdoor-classroom education. This isn’t a ropes course, folks. Scientists and master teachers get their feet wet and hands muddy along with participants while sharing content and techniques for effectively teaching environmental science and social studies. The Mississippi and St. Croix Rivers and shores are your classrooms and a canoe your desk and chair for part of the three-day seminars. The CGEE is technology savvy as well. They create multi-media for students that gives teachers an indoor-classroom tool. See why Waters to the Sea won the Panda, Wildscreen film festival’s top interactive- learning award. This entry was posted in Photo Friday and tagged CCGE, Hamline University, Mystery Photo Friday, Rivers Institute, Waters to the Sea. Bookmark the permalink. I think that is Winslow house condiminium in the background, so I am thinking you are on the bank of the mississsissiissppii. And the winner is Laura with her absolute conviction that the photo was taken at the Guthrie Theater in Minneapolis, Mn. It was! Good Luck with today’s Mystery Photo Friday.